It was the weekend before Veteran’s Day and, truth be known, I was looking forward to seeing what shape C.W. might choose this year. As the loyal reader will recall, he can be quite talented when it comes to celebrating the military. This year he didn’t disappoint. How shall I describe him? 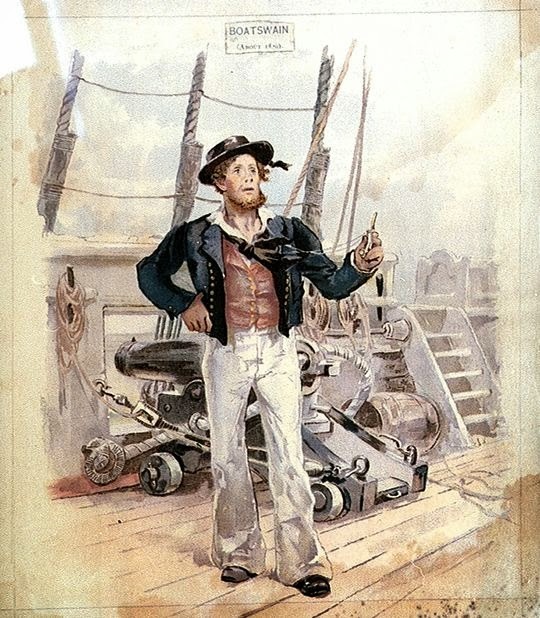 Well, he was a 19th Century ship’s bosun. That’s right, he was an exact replica of a sailor from the days of iron men and wooden ships. He could have stepped right off the deck of USS Constitution or the HMS Victory. He even sported a bosun’s pipe, that little curved metal device that emits a sharp, piercing whistle that can be heard during the roughest seas. It is used to convey orders on board a naval vessel. “Fore and aft,” I said, trying to catch his drift. “Carry on Lad,” I said, sort of getting into the mood of the moment. “No, take babies,” he said. He had a point. I forgot for a moment that I was talking to an alien who had chosen the shape of a historical sailing master. “Fore and aft,” I said. the battle is over as before it begins? - C.W. He had me. “I don’t know,” I said. “Fore and aft,” I said.